PunditGeorge and spouse took a whirl-wind trip to Santa Fe to visit daughter Genia Michaela and take in the Santa Fe Playhouse production of Benchwarmers - their 8th season of eight fifteen minute one-acts involving a lone bench. Scripts are by local writers, including Genia. Her piece, The Speed of Love, was the finale. It was the dining that got our attention, however. 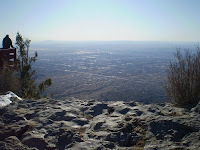 First stop after flying into Albuquerque was to take the tram to Sandia Peak. Gorgeous day with visibility 100+ miles and snow on the east side. I’m happy to report the High Finance restaurant still offers its celebrated green chili stew, the likes of which I can’t find elsewhere. On a quick drive to Taos to take in the scenery, a friend of Genia recommended the Trading Post for late afternoon dining and it was super! We enjoyed Penne Arrabrata, Piccata Milanese, and steamed mussels (yes, mussels.) Genia insisted we breakfast at the Chocolate Maven before we left Santa Fe. If you didn’t know what it was, well, Giada De Laurentiis raves about it, you wouldn’t know from the outside. Inside we sat for breakfast at the large window looking into the bakery itself - quite a show. Back to Albuquerque and home again - very well fed and refreshed by the stunning New Mexico vistas.